Located in St Jean de Monts, just 3 km from the beaches, Camping Le California **** welcomes you in an exceptional green setting for a pleasant holiday with friends or family. On site, you can enjoy an aquatic area of nearly 400m ² with 3 pools well individualized, 1 paddling pool for young children, 2 pools including a larger with slides and a heated indoor pool. There is also a jacuzzi and sauna for you to relax and unwind. You will also have at your disposal bicycles and go-karts at the reception to have fun circulating within the campsite. For those who would like to enjoy the area, a half-day rental, day or week of bicycles is possible (surcharge). During the school holidays, you will be offered sports activities: water aerobics, water polo, petanque tournaments, basketball, football .. But also a fitness session in the morning to wake you up smoothly. In the summer, group games for the whole family will be offered so that you can have fun and challenge your friends in a warm and friendly atmosphere. After a good day, find yourself in the evening around theme nights. In July / August, your children will have fun and make new friends in the Children's Club from 5/12 years old from Monday to Friday morning. During the summer holidays, a grocery store with bread store and a launderette will be at your disposal. Enjoy your stay, to go for many walks around Saint Jean de Monts, whether in a carriage, boat or canoe. You will discover the Vendean nature, the sea walks, the canals in the old salt marshes ... and much more! You will also appreciate the surroundings such as Saint Hilaire de Riez and Saint Gilles Croix de Vie. 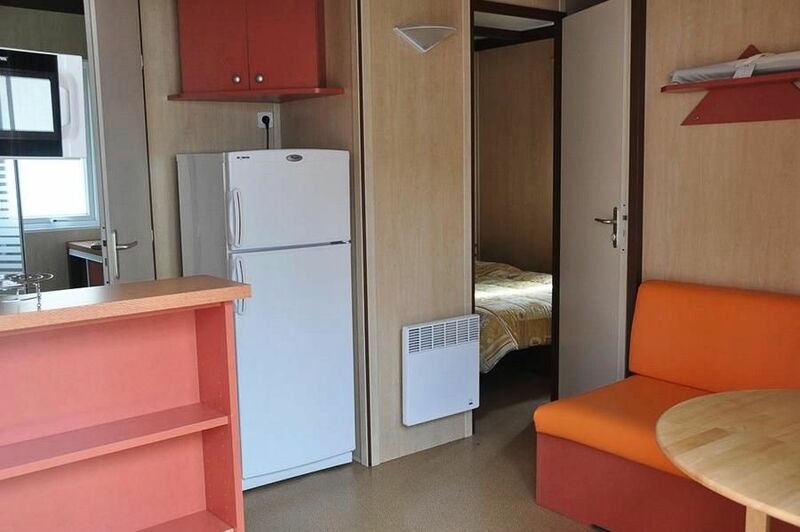 Chalet 3 rooms for 5 persons of 25m ² approximately, composed of a corner living room, a corner cooks equipped, a room with a double bed (140x190) and possibility of putting a baby bed, a room with 2 beds single (80x190) bunk beds and a single bed 70x190cm, a shower room with WC and an uncovered wooden terrace. The Chalet includes a kitchen area equipped with fridge, hotplates, microwave oven, cooking utensils and crockery adapted to the number of people in the accommodation. The duvets and pillows are included for each bedding (sheets optional with supplement).